Your time is too important to put anyone else's hands. Individuals who travel frequently know how difficult it is to find airport transportation on the spot and even more difficult when in a foreign country, pick Feraltar for your Cancun airport transportation services. It is needless to say that going to the airport is stressful enough without having to worry about traffic and whether or not you will arrive on time. The wisest thing you can do when you need to get to an airport is let someone else do the driving. Indeed, taking a taxi that specializes in delivering first class transportation will ensure that you have a hassle free arrival at the airport. At Feraltar we offer several options for you to choose from so they make it very easy for you to get transfers for yourself or even for a group of people all at very low costs. One thing is certain: by hiring professional services you will have peace of mind and you will arrive at the desired destination safe and on time so make sure you book in advance for your Cancun airport transfers. Excellent Service! I want to thank you to whole team Cancun Transfers, Me and my family enjoy the trip without worrying about schedules and drivers were alway on time and the vans are very spacious and comportable, thanks specially to our drivers who took us safely very helpful, I will recommend to all our friends! We hope to return soon!. The Cancun airport private transportation is our speciality, you will travel aboard a Chevrolet Van Express, only for you and your friends, the vehicles are of a recent model and all of them have air conditioning. 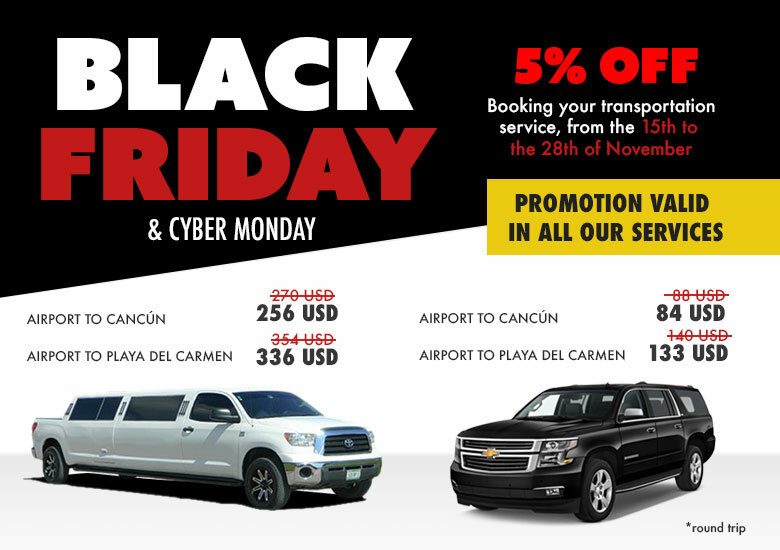 This service is one of the best cancun airport transfer service, with a low cost and a great quality service, you will not regret. Private Transportation is available 24 hours a day, no waiting time, no lines, departs to your destination as soon as you board the vehicle. This is a direct service, without additional stops. Because you deserve it, we offer you an exclusive VIP transportation service from and to the cancun airport, aboard of a Chevrolet Suburban Luxury Edition, the VIP transportation service will let you fill all the comfort that you deserve. All the vehicles have DVD and Air Conditioning. This service also includes amenities such as water bottles and wipes and all this at an incredibly discounted price. If you are traveling on a small group, this is a perfect option for you, thanks to the space for 5 passengers of the Suburban, you and your friends will definitely enjoy your transportation.